Home The Surgical Scaffold Collection What is a Galatea Scaffold? 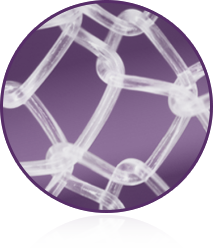 Galatea surgical scaffolds are bioresorbable, monofilament mesh, constructed of poly-4-hydroxybutyrate (P4HB™ Biopolymer) — an advanced, biologically produced polymer. Watch the Galatea Scaffold Collection Overview here. Galatea scaffolds are indicated for use as a bioresorbable scaffold for soft tissue support and to repair, elevate and reinforce deficiencies where weakness or voids exist that require the addition of material to obtain the desired surgical outcome. This includes reinforcement of soft tissue in plastic and reconstructive surgery, and general soft tissue reconstruction. Galatea scaffold is also indicated for the repair of fascial defects that require the addition of a reinforcing or bridging material to obtain the desired surgical result. See how Galatea surgical scaffolds work. Find out why you should use Galatea scaffolds to support your next surgical procedure.